Exam implementation will happen in Q1 of 2018. If you plan to take exam in 2017, no worries PMBOK 5th edition is good. Core remains the same: PMBOK is primary reference for PMP exam and PMP Exam is not the test of PMBOK. Harmonization of process groups, tools, and techniques. 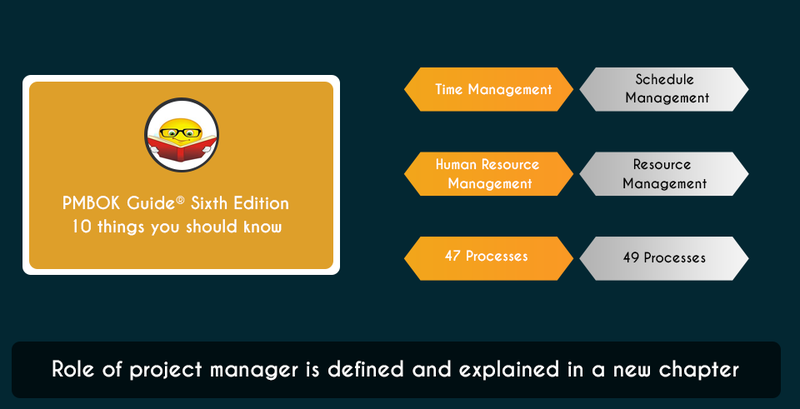 Role of project manager is defined and explained in a new chapter. There will be 49 Processes from current 47 processes. There have been tremendous improvement and evolvement in the project management methods in recent years and PMI has implemented them in PMBOK to increase chances of the success of the projects.